Perched on the third floor and facing the Gulf of Mexico, this 3BR/2BA condo offers sweeping views and a vast array of top-of-the-line amenities. During your stay, enjoy a heated swimming pool, hot tub, tennis courts, and private beach access. Tasteful touches and stylish decor abound inside your unit, complete with Saltillo tile floors and Corian countertops. Outside, you’ll find a large balcony with ample seating and Gulf views. LIVING AREA A large leather sectional sofa and matching armchair surround the 50” TV. 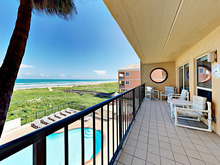 Kick back and watch your favorite shows, or open the glass door to the balcony and relax amid the fresh coastal breeze. KITCHEN & DINING Prep beach snacks in the modern kitchen, equipped with a full suite of stainless steel appliances. When you’re ready to eat, gather at the four-person dining table, or perch at the kitchen bar for three. BEDROOMS & BATHS This home sleeps six guests in three bedrooms, each appointed with hotel-quality linens. Two full bathrooms are stocked with a complimentary starter supply of toiletries. Gulf views await in the master suite, furnished with a king-size bed and 32” TV. The en-suite bathroom is configured with a double vanity, walk-in shower, and walk-in closet. Two memory foam rollaway beds can also be found in the master closet. In the second bedroom, you’ll find a full-size bed as well as a 50” TV, while the third guest room offers a comfy queen bed. Situated between the two guest rooms, a full bathroom provides a walk-in shower. OUTDOOR AREAS The third-floor balcony commands sweeping views of the beach as well as the pool. Six chairs offer enough seating for your whole group. Enjoy private access to the beach via a charming boardwalk. Spend the day snorkeling, swimming, and playing sand volleyball, before heading back to your condo to take advantage of even more recreational amenities at Suntide II Condominiums. Play a match at the on-site tennis courts, swim in the shared pool, or take a rejuvenating dip in the hot tub. As evening falls, host a family cookout at the on-site grill area with Texas-size barbecue pits. EXTRA AMENITIES & DETAILS Additional amenities include complimentary Wi-Fi, cable TV, Netflix, elevator access, and a communal laundry room with coin-operated washer/dryers. Unassigned parking is available for one car in the complex, with both covered and uncovered parking. Additional parking (on the street and at the beach access lot) may also be available on a first-come, first-serve basis. This property is registered with the City of South Padre Island Permit No. 2015-627472. THE LOCATION When you’re ready to venture out, you’ll love being within walking distance of a wide variety of dining, shopping, and entertainment. To stock up on beach snacks and groceries, Blue Marlin Supermarket is 1 mile away. Adventurers can check out South Padre Island Watersports (5-minute drive), where you can rent bikes, kayaks, and paddleboards. And Schlitterbahn Waterpark is just a 10-minute drive away.